Do I need a tumblelog? Mr W sent me an invite to skitch, which looks like an interesting ‘add notes and shapes to an image and upload it’ sort of application. You can upload to my skitch or flickr among other places or use it with Comic life from the same developer. I’ve not really seen a need to use twitter as it would seem more useful to say consultants and conference dwellers than teachers, but I noticed a couple of interesting posts Christopher D. Sessums :: Twitter Me This: Brainstorming Potential Educational Uses for Twitter and ELT notes: This Twittering Life which are food for thought. Kind of links to the ideas hovering around David Warlick‘s posts: A Bucket of Drops?. and It Isn?t Easy which join up in my mind at least. The possibilities of the new technology are accelerating away from what actually goes on in the classroom. There are some interesting comments in the It Isn?t Easy post, including one about an unnamed blogging guru giving an admiring teacher an unasked for autograph, which made me laugh out loud. 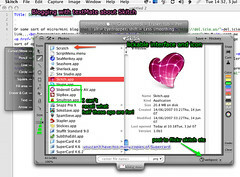 Exciting for me Pivot X2.0 screenshots., I use pivot to run this and the other Sandaig blogs, looks like they have a lot of nice new features in the works. So i probably don’t need a micro blog for these notes to myself, just keep a textmate window open all day and add to it.